GOAL EaglesScott Lycett scores a goal from a Stoppage. GOAL PowerRobbie Gray scores a goal from a Turnover. BEHIND PowerKarl Amon scores a behind from a Stoppage. GOAL PowerMatthew White scores a goal from a Turnover. BEHIND PowerJake Neade scores a behind from a Stoppage. SUPERGOAL PowerAndrew Moore scores a supergoal from a Turnover. GOAL EaglesScott Lycett scores a goal from a Turnover. GOAL PowerKane Mitchell scores a goal from a Turnover. BEHIND EaglesMark LeCras scores a behind from a Turnover. BEHIND EaglesKane Lucas scores a behind from a Turnover. BEHIND PowerRobbie Gray scores a behind from a Turnover. 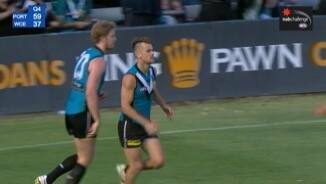 Port Adelaide InterchangeNathan Krakouer was substituted for Jasper Pittard. GOAL EaglesAndrew Gaff scores a goal from a Turnover. BEHIND EaglesJoshua Kennedy scores a behind from a Turnover. GOAL PowerKarl Amon scores a goal from a Stoppage. West Coast Eagles InterchangeLiam Duggan was substituted for Xavier Ellis. West Coast Eagles InterchangeTom Lamb was changed with Jamie Cripps due to an injury. 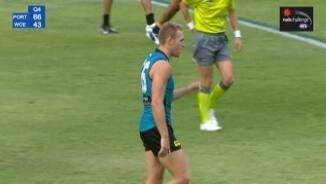 Port Adelaide InterchangeKane Mitchell was changed with Oliver Wines due to an injury. West Coast Eagles InterchangeMitchell Brown was changed with Xavier Ellis due to an injury. GOAL PowerJohn Butcher scores a goal from a Turnover. 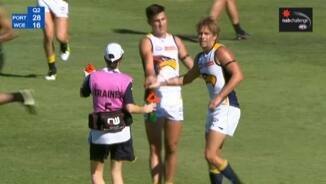 West Coast Eagles InterchangeMark LeCras was changed with Jamie Cripps due to an injury. GOAL EaglesJoshua Kennedy scores a goal from a Turnover. BEHIND EaglesJoshua Kennedy scores a behind from a Stoppage. RUSHED BEHIND to Power from a Kickin. BEHIND PowerAaron Young scores a behind from a Turnover. GOAL EaglesTom Lamb scores a goal from a Stoppage. RUSHED BEHIND to Eagles from a Kickin. BEHIND PowerJohn Butcher scores a behind from a Stoppage. GOAL EaglesMatthew Rosa scores a goal from a Turnover. 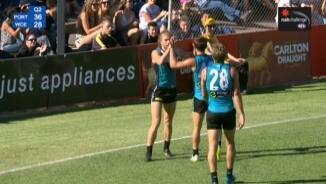 Port Adelaide InterchangeRobbie Gray was changed with Hamish Hartlett due to an injury. RUSHED BEHIND to Eagles from a Turnover. GOAL PowerRobbie Gray scores a goal from a Stoppage. GOAL PowerSam Gray scores a goal from a Turnover. BEHIND PowerKane Mitchell scores a behind from a Turnover. GOAL PowerJustin Westhoff scores a goal from a Turnover. GOAL PowerMatthew Lobbe scores a goal from a Turnover. Welcome to Norwood Oval for the Port Adelaide v West Coast Eagles Round 2 clash. 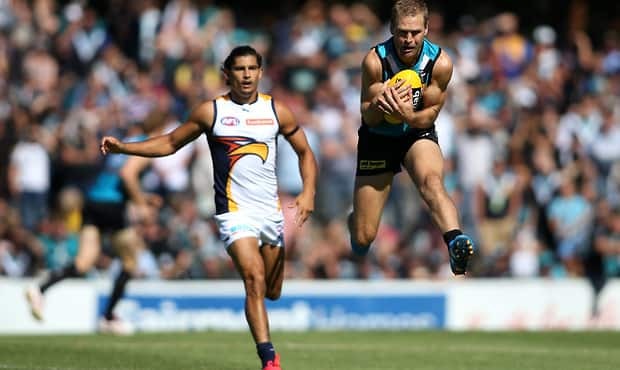 ROBBIE Gray has fired Port Adelaide to a 40-point win over West Coast in the Power's NAB Challenge opener in Norwood, but injury scares for both sides soured the occasion. Port star Hamish Hartlett was subbed at quarter time with a groin injury, and West Coast's horror pre-season continued with injuries to Xavier Ellis (hamstring) and Sharrod Wellingham (calf). Gray kicked three goals and had 28 touches as the Power won 1.11.14 (89) to 0.7.7 (49). Hartlett started the game as part of a strong Port squad heavy on experience, with just two players - Karl Amon and Brendon Ah Chee - yet to notch an AFL game. The gun midfielder has had a history of hamstring and shoulder injuries but has managed to stay relatively fit over the past two seasons, playing 44 of his 90 games. He appeared in solid touch and picked up four early possessions before leaving the ground during the opening term. Stand-in Power coach Matthew Nicks was confident the injury was minor and Hartlett would only miss one week. 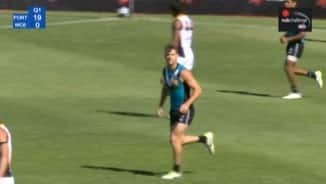 Wellingham, who endured a tough debut season with the Eagles last year due to poor form and injury, appeared to injure a calf and was an early substitution. Ellis was the next to succumb to injury when he hurt his hamstring as he tried to intercept a Power miss-kick. The former Hawthorn player managed 17 games for the Eagles last year but has a history of hamstring issues and was restricted to just 16 games from 2011-2013. Ellis pulled up before taking the mark and then refused to kick, instead handballing to a teammate. He left the field immediately with his hands on his head. in contrast to the Power's squad, the Eagles took to the field without the likes of ruckman Nic Naitanui, forward Jack Darling and midfielder Scott Selwood. 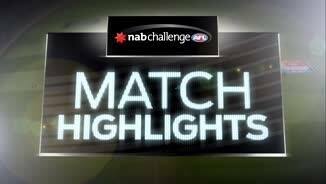 Brilliant kicks first by veteran Kane Cornes and then Hartlett set up two early Port goals and then a slick transition of play from centre wing saw Gray slot home the Power's fourth from the opposite flank. An impressive first quarter from draftee Tom Lamb (14 disposals, one goal) helped keep the Eagles in touch at the first break. The forward showed great attack on the ball and slotted his first of the day late in the quarter. West Coast upped its intensity in the second term. 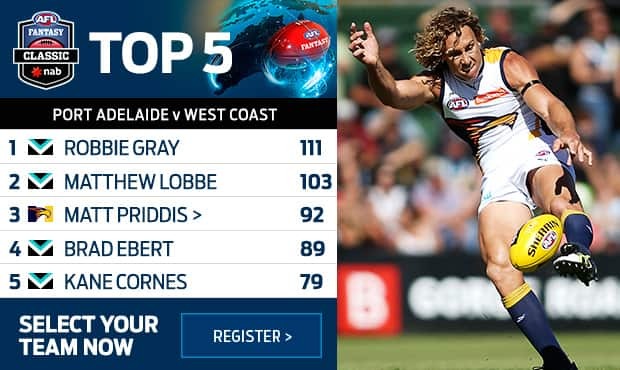 Reigning Brownlow Medalist Matt Priddis (26 disposals) began to accumulate possession and veteran forwards Josh Kennedy and Mark LeCras reduced the margin to a single point. Port's disposal efficiency had dropped off but before the Eagles could capitalise John Butcher (seven marks, one goal) made up for his early miss with a contested mark in the goal square and he hammered it home. Aaron Young then dribbled a loose ball through from deep in the left pocket for an incredible goal after courageous play from Ollie Wines. Eagle Andrew Gaff started to get his hands on the ball and goaled midway through the third term after a major to Power youngster Karl Amon. But with Gray running rampant all over the ground it wasn't long before Port restored command. Andrew Moore nailed the game's only supergoal midway through the last term, icing a strong Port Adelaide performance. 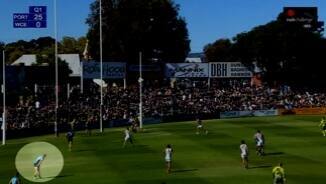 Though the skinny Norwood Oval didn't allow Port to fully utilise its running game, Nicks said he was pleased with his side's contested game. "We still rate ourselves really highly as far as our in-and-under. We managed to match them in that area," he said. "I thought our guys stood up early and held that throughout the game." 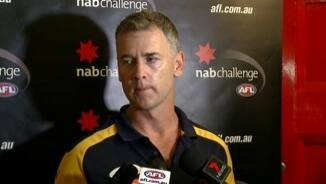 Eagles coach Adam Simpson said his side's focus remained on preparing for round one. "I thought we showed a little bit of resilience," he said. "It could have been anything after that electrifying start. I think they kicked the first four goals so I'll look at it with the glass half full." Port Adelaide: As remarkable as it sounds given his stellar 2014 campaign, Robbie Gray appears set to take his game to another level. 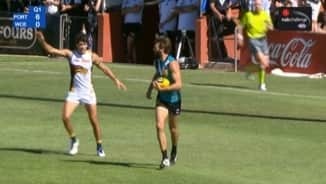 After clearly being the best player on the field during Port's internal match simulation he was incredible against the Eagles with three goals from five shots. West Coast: In the absence of Nic Naitanui, Scott Lycett faced a tough job against one of the best ruckmen in the AFL in Matthew Lobbe. Though Lobbe won the battle, Lycett held his own with nine disposals, 19 hit-outs and two goals. 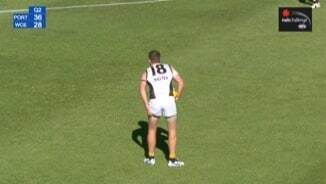 Naitanui's obviously the main man but Lycett showed he can compete when called upon. 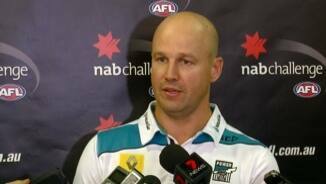 Port Adelaide: Of those on Port's list yet to debut it's been Karl Amon who has drawn the most praise from teammates. The young running midfielder/forward looked solid too – his game including a brilliant spearing pass to Gray in the last quarter that resulted in a goal. Nathan Krakouer has AFL experience and his form against the Eagles suggested he'll be able to play a role this year if called upon. He had just over a quarter on the field and still managed seven disposals. Brendon Ah Chee has finally had an injury-free run at a pre-season and he looked in good touch on Sunday. He didn't accumulate many possessions but attacked hard and defended well. West Coast: The club's first pick at last year's draft, Liam Duggan was subbed into the game at half-time but didn't impact the game. Tom Lamb was hot early with a string of possessions, a strong mark and goal, and his presence in attack was noticeable with six marks. Jackson Nelson had a tough day out in West Coast's defence. It wasn't the greatest day out for rookie Kane Lucas. He struggled to win much clean possession and missed a gimme in the third quarter. Port Adelaide: Karl Amon replaced Hamish Hartlett at quarter time Nathan Krakouer replaced Jasper Pittard in the third quarter.